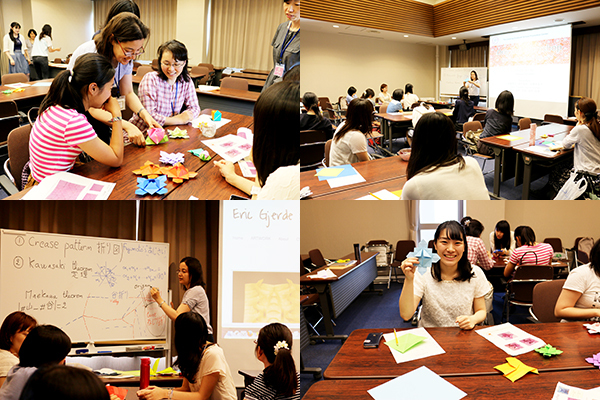 On June 24, we held the second session of origami workshop, titled /The math behind the art/. During the first part of the workshop, we showed a talk delivered by Robert Lang (http://www.langorigami.com/),who is a prolific origami expert. He explains how mathematical problems allow designing complex objects of art. Indeed, designing an origami model can be reduced to the circle-packing problem. Pictures of his own impressive models of animals and insects illustrate the design and abstraction process in origami. He also closely worked with aerospace industries to efficiently fold solar arrays for their transportation and deployment in the space. During the second part, we practiced Fujimoto’s folding technique by making a hydrangea. Fujimoto’s fold is an example of some of the mathematical theorems mentioned in Lang’s talk.